One of the simplest types of all-wheel drive - with forced connection of front axle. Transfer have a reduction gear (planetary) for heavy-duty conditions, that operates in 4WD mode. 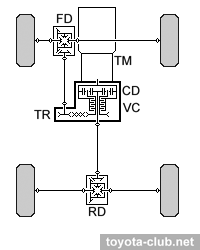 Transfer is controlled by lever, front drive shafts are connected to wheels with mechanical freewheel hubs (manual switching). At the second variant used electric hubs and actuators at transfer. "+" Relative simplicity, reduction gear availability. "-" 4WD mode can be used on slippery surfaces only (rain, ice, snow). Otherwise, noise increasing, fuel consumption increasing, steering control deteriorates, and most importantly - highly worn tires and the transmission components. Mechanical hubs are quite reliable, but not easy-to-use, electrical - not so reliable. 2WD→4WD - at speed below 80 km/h with accelerator released, not engage during slipping (only after a full stop). 4WD→2WD - - at any speed. 4WD-H→4WD-L - when the vehicle is stationary and at "N" range of transmission. 4WD-L→4WD-H - when the vehicle is stationary and at "N" range of transmission. 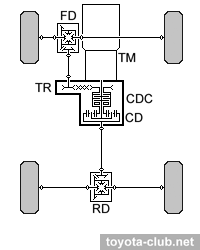 In order to make front axle connection easy and get away from electric hubs, ADD (Automatic Disconnecting Differential) was implemented, which disconnect one of front axle shafts by actuator. As a result, rotation from wheels is not transmitted to the front propeller shaft, but the front axle gears are permanently lubricated. 4WD control - electric (by "4WD" button on the transfer lever) or semi-mechanical (by lever, similar to PT-Hub). Modern models have controller instead the lever. 2WD→4WD - at speed below 80 km/h with accelerator released, not engage during slipping. 4WD→2WD - at any speed. 4WD-H↔4WD-L - when the vehicle is stationary and at "N" range of transmission. 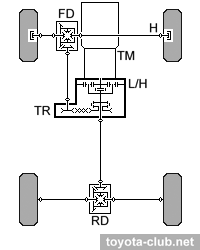 There is disconnected front-wheel drive system with ADD in this scheme, but the transfer obtain asymmetrical differential (torque distribution between front and rear wheels - 40:60). So, 4WD can be used permamently in all conditions, and front drive may be disconnected for the fuel economy only. "+" Full-time all-wheel drive in combination with a potential economy mode. "-" Unnecessary complex design compared to the full-time. 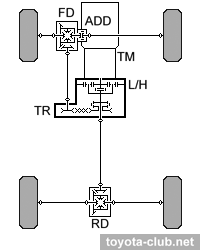 Modern models also have "AUTO LSD" function (at 2WD mode one of the slipping wheels is braked, emulating a partial rear differential lock) and "A-TRAC" (traction control, limiting the engine output at the start or acceleration on slippery surfaces). H2↔H4 - speed below 80 km/h with accelerator released, not engage during slipping. H4H→H4L - at speed below 100 km/h, not engage during slipping. H4L↔L4L - when the vehicle is stationary and at "N" range of transmission. H2↔H4 - at speed below 100 km/h (if temperature below -15°C - 70 km/h). H4↔L4 - when the vehicle is stationary and at "N" range of transmission. The basic scheme for vans with the center differential, partially locking by viscous coupling. "+" Full-time four-wheel drive, n not necessary to control. "-" Low efficiency of viscous coupling, no low range in transfer. 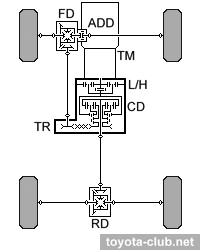 Toyota top-model's have an advanced scheme of 4WD, similar to principle of the STD I for initially-FF cars. Full-time all-wheel drive with a center differential (torque distribution between front and rear wheels - 30:70), locking by hydromechanical clutch with electronic control. Some details here. "+" Full-time all-wheel drive, no need to control by driver. 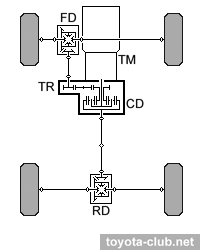 Toyota's flagship have several simpler (compare to FT-H) 4WD scheme - with asymmetrical (40:60) Torsen differential, and gear drive to front wheels at transfer. Modern mid- and full-size SUVs are obtained with full-time all-wheel drive, asymmetrical Torsen differential, full locking mechanism, chain drive to the front wheels, low range. Torque distribution between the front and rear wheels - 40:60 (nominal) and 28:72 to 58:42 (dynamic, depending on driving conditions). Low-version have single lever (LC 120) or the controller, providing three modes - H4F, H4L, L4L. 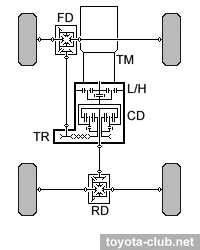 Other versions have splitted control for center differential and low range gear, thar allows to use L4F mode. Abbreviations: TM - transmission (gearbox, CVT), TR - transfer, FD - front differential, RD - rear differential, CD - center differential, CDC - hydraulic clutch, VC - viscous coupling, EC - electromechanic coupling.